I’ve written before about my love for coffee, both as a beverage and as a fragrance. I’m always surprised that more coffee-scented body products don’t exist. Surely I’m not the only person who loves this smell so much? For anyone who shares my obsession, here’s a summary of a few high-quality toiletries that include actual coffee for its smell as well as its other benefits. Lastly, if you’d rather just drink something coffee-flavored, I can recommend one of my favorite beverages: Manhattan Special. This bottled treat, made in Brooklyn since 1895, is a fizzy, potent mix of espresso, sugar, and seltzer water. I buy Manhattan Special from my local Italian grocer, but it was finally made available on the internet just a few months ago, extending its addictive reach beyond the New York metro area. Drink it chilled, admire the vintage label illustration of a Jazz Age couple embracing before a Manhattan skyline, and ponder the singular appeal of all things coffee-enhanced. (About $2 per 10 oz. bottle though sodapopstop or corellisspecialtyfoods; you can read more about the company here. Lovely review. I love the Alba Botanica Kona Coffee After-Sun Lotion. Their Green Tea SPF 30+ Sunscreen is effective and smells great, too. It's funny. I don't actually drink coffee much these days, but I remain addicted to the smell of it. I remember getting up in the mornings when I was a kid and sitting in the kitchen while my father drank his coffee before work. My father could be intimidating a lot of the time, but for this ritual he was surprisingly tender, and he used to take the very last drop in his cup, pour milk up to the top and stir in a little sugar for me. I remember feeling so grown-up and close to him, drinking out of his mug and talking with him. Of course, if it's true that coffee stunts growth, he may be the reason I am not a supermodel. Anyway, there must be a lot of people with similar memories of their parents drinking coffee in the morning. Not to mention, with the Starbucks boom, half of us had dates over coffee during college. So I agree that it's weird there aren't more coffee-scented products. You'd think Starbucks would have jumped on that train long ago. Hi, Mrs. Williams! That's a touching recollection. My mother has always been a coffee-drinker, so the smell of coffee evokes some similar feelings for me. The Sephora store line has a few coffee-scented body products, I believe, but the ingredients look cheap-ish, so I haven't purchased any of them. Lush used to have a coffee lip balm, but it didn't work very well (although it smelled great), and it has been discontinued. I have a Perlier Caribbean Vanilla and Coffee scent that I was really surprised to enjoy (found it as part of a sampler I impulse-purchased on HSN), enough to get the full bottle. I also really liked A*Men Pure Coffee, which I hope to find a smallish bottle or decant of at some point. When I tried it on I was sniffing my wrist and giggling for several hours. 'll have to give the Alba lotion a try – it sounds pretty great. Hi Tama, I've heard of A*Men, but haven't tried it yet. I like Bond no. 9's New Haarlem, for a coffee perfume, so I'd probably enjoy A*Men too. That Perlier product is new to me; thanks for the suggestion! You know since it's all about coffee here, lemme ask, have You ever tried Desnuda by Emanuel Ungaro? This is a very nice, oriental perfume with a beautiful coffee accord in it. Just thought I'd ask. Hi, and what about Bond no. 9 New Haarlem? Not my cup of tea (ha!ha!, couldn't resist), but it does dry down to a coffee scent. Or what about Jo Malone's Black Vetyver Cafe? Hello, lovethescents, I do enjoy New Haarlem and I own a few samples of it that I wear from time to time. I tried Black Vetyver Cafe once, but I'm not a fan of vetiver, so that didn't work as well for me. Thanks! IrisNobile, I actually haven't tried that one. I can't even picture the bottle, so I probably haven't seen it around much. I'll look into it, thanks! Philosophy has coffee scented 3-1 products now too. 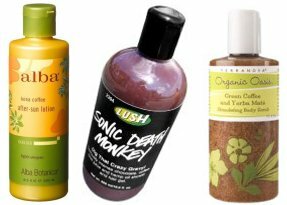 (bubble bath, shower gel and shampoo all in one) They smell so good! They only scent while you are using them, though. Once you are out of the shower it doesn't stay with you. They are available at philosophy.com and sephora. Thanks for this post! My husband and I are die hard coffee addicts and our time together in the very early morning before work, drinking our absolutely necessary two cups each, is precious marriage bonding. In addition to New Haarlem, which I love, my suggestions for coffee scents are Ava Luxe Cafe Noir and an oldie to be found @ online discounters, L'Or de Torrente by Torrente. It comes in a drop dead gorgeous bottle and is a rich dark floral that has a distinct coffee note. Definitely unique, very cheap and if you hate it, well, you still have the pretty bottle. I'll have to check out the Alba lotion, it sounds great. Thanks, Juelz! Is there any scent that Philosophy *hasn't* turned into a 3-in-1 by now?! That sounds like a good marriage-bonding ritual to me! I'm still trying to convert my husband from green tea to coffee. It's one of our few differences! I'm an Ava-Luxe fan, so I have no idea why I haven't tried Cafe Noir yet, and I've heard of L'Or de Torrente but have never seen it in person. Time to check out the online discounters! Ooh, Jessica, that Manhattan Special sounds gorgeous. I wonder if it will ever make it to the UK? We don't seem to produce nearly enough coffee-flavoured foodstuffs over here. When it comes to toiletries, though, I find I'm fascinated but rarely tempted to buy. I adore the smell, but don't really want to feel as if I've spilled a latte on my lap! The A*men Pure Coffee is one I could sniff from the bottle all day, but when I've tested it on skin, I felt kind of grubby (tells you what a clumsy drinker I am). But now that I've typed this in, all I can think of is my cafetiere, but it's nearly midnight and I mustn't! Ooooooh, coffee is so scrummy…. Hello VanillaGirl! Manhattan Special has been one of my very favorite treats lately. I've always liked it, but I didn't have steady access to it until the past year or so! I have a feeling that it isn't available in the UK — it was barely available outside NYC until this past year — so now I feel sorry for tempting you! I love the smell of coffee but I'm a little reluctant of coffee scented body products. I only drink black Dallmayr coffee, and I hate coffee with lots of flavorings, milk, sugar, etc. I would like a perfume with a true black coffee note, but if i see “coffee” in the list of notes I'm scared it'll be mocha-ish. I live in rural Virginia so I don't come in contact with perfume very often and I can't usually try them in person. Krokodilgena, I don't think most people outside New York City come into contact with egg creams! They're definitely a local specialty, and they're made from milk, seltzer water, and chocolate syrup. They're heavenly. I'm not usually a foody-fragrance person; coffee is one of the few exceptions for me. I don't like too much chocolate, either. Some of the recommendations above might suit you, particularly Bond no. 9's New Haarlem and Ava-Luxe Cafe Noir. I bet you could find samples on the internet, if you (wisely) don't want to buy a whole bottle unsniffed. Thanks for the post! I love all things coffee, too. Have you tried Cafe by Neil Morris? It's one of his vault scents, and it is heavenly! I've only tried the N Morris scents that are available at Takashimaya, and that was a few months ago. I have to confess I don't remember too much about them. On the other hand, I can recommend Ayala Moriel's Finjan perfume, an interpretation of dark, strong Turkish coffee. Well, the scents don't stay noticeable for too long after use… at least, no one has commented on any lingering coffee smell around me! The Macadamia Body Polish must be sniffed to be believed. I think I reacted out loud when I first smelled it in a shop. Hi Jessica. I love the coffees! It is the caffeine in the coffee products that is good for your skin. It is the active ingredient in body firming and sculpting lotions and creams. I'll have to try the Alba after sun moisture. Coffee to me smells like an energetic but soothing day. You know the oxymoronic saying, ” I'm going to relax with a cup of coffee.” The shower gel sounds like it would wake you up. They all sound fun. Must order at least the moisturizer. Also, I tried some of your suggestions on my pretty but strong character, and I am happy to say I found Cruel Gardenia from the Perfumed Court and I think the Guerlain smells like angel's skin. The problems are $230 a bottle, hard to find and for everyday it lacks any real woody or musky dry-down. It is also very close to the skin without a lot of silage…or any. So I found the ballpark, but lost the ball. It doesn't smell at all like gardenia, but rather some soft supernatural white flower. I need a woody floral or soft oriental. I ran out of money for Guerlains La Heure Blue, and Chamade and French Cancan turned on me. ??? I'm writing Robin a letter. I hope she picks me. I'm so frustrated…can't cha tell? Also. I need to buy a fragrance for my son's 27th birthday. He's a long hair hippie who smokes (mother weeps). He used to like CK1 and CKbe but he needs something a little more sophisticated that blends with cigarettes? He's kind of an anarchist. I know nothing about men's frags. My X wore Polo and I loved it, so it's obviously out for my son. Hi Becca, I completely understand the oxymoronic truth of relaxing with a cup of (stimulating) coffee! I hope you'll write a letter for the Monday Mail, to see what some other NST readers might recommend for you. As for your son, I'm not an expert on men's fragrances (and my DH doesn't even wear fragrance! ), but have you sniffed any masculine scents from L'Artisan Parfumeur? I think Mechant Loup, Tea for Two, L'Eau du Navigateur (coffee note! ), and Timbuktu are all interesting and unusual.